An exciting thing about these small, independent presses is that many of them are edited by women, which is not something you can say about the big presses, which tend still to have male editors at the top. Nine Arches Press is edited by Jane Commane and according to Ian McMillan, “Here is a press that genuinely revels in publishing new and exciting poetry; when I read a Nine Arches Press book I know that my mind will be a bit bigger once I’ve finished it. And my smile will be wider.” Jane Commane says, ‘Nine Arches Press was set up in 2008 and I was hugely fortunate to have a lot of support, including from fellow women editors like the wonderful Helena Nelson at HappenStance who wrote to me within a few months of the press starting, both to wish me luck and to kindly offer advice or support if I needed it. There are been a growing number of women editors in poetry (Emma Wright at Emma Press, Jan Fortune-Wood at Cinnamon, Amy Wack at Seren, Jacqui Rowe and Meredith Andrea at award-winning pamphlet press Flarestack and others) which can only be a good thing, and I am proud to count myself amongst their number. It is also worth remembering in many cases, we are not just editors, but due to the micro-size of our publishing enterprises, we are proof-readers, typesetters, graphic-designers, marketing and social media specialists, events organisers, book-keepers and business managers, creators of impressive spreadsheets and much more in between. Here’s to these many one-woman and one-man bands and the small presses and independent publishers who continue to believe in poetry.’ Poets published by Nine Arches include Jo Bell whose event launched the Ledbury Poetry Festival and Sarah James who performed at the Festival’s Poetry and Cider Evening. Pavilion Poetry launched this year with collections by Eleanor Rees, Sarah Corbett and Mona Arshi (reading together on Monday 6 July at Ledbury) and is edited by internationally acclaimed poet Deryn Rees-Jones. Their poetry ‘sounds the depth of story, language, territory and selfhood’ writes Deryn who is well-known for her keen interest in women’s writing. She has published renowned critical works on women’s poetry ‘Consorting with Angels’ and an anthology Modern Women Poets. Of the three collections Pavilion launched this year, Mona Arshi’s Small Hands has just been shortlisted for a Forward Prize for Best First Collection. 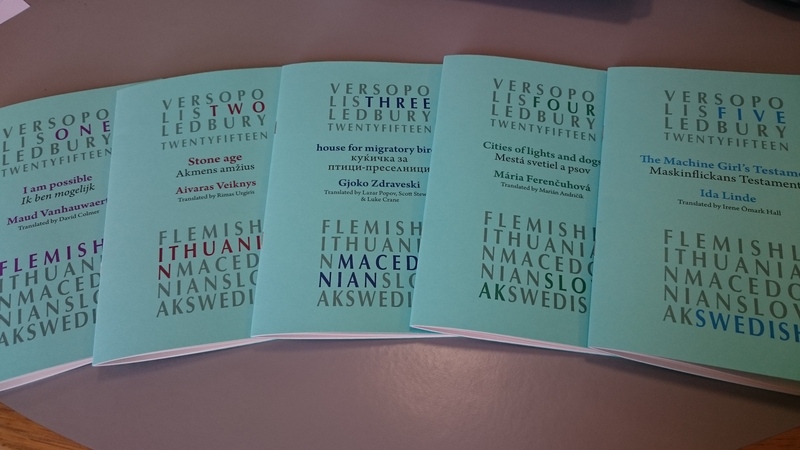 Eleanor Rees has been selected to take part in Versopolis: A Celebration of Emerging European Poets and as a result she is receiving invitations to perform at Festivals in Europe and is having her poems translated and published in beautiful limited edition chapbooks.